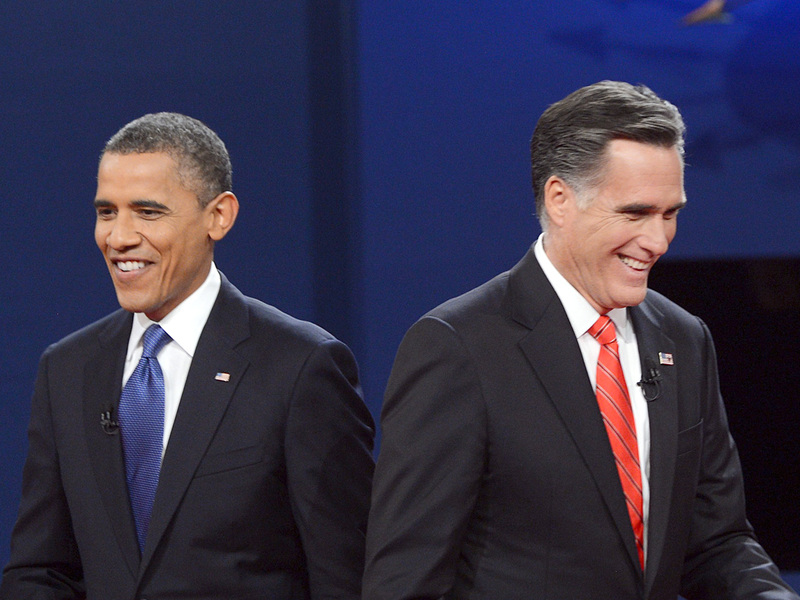 As they prepare to meet for the second presidential debate, President Obama and Mitt Romney are focusing on adjusting their debate style over the substance of their remarks. After a languid performance in the first debate, Mr. Obama promises to be more aggressive and show more passion this time around. Romney, meanwhile, intends to build on the progress he made in the first debate by conveying authenticity. While style typically has at least some impact in the outcome of presidential debates, it could be more critical in this one, which takes place Tuesday night at Hofstra University in New York. The town hall-like format of the debate -- in which undecided voters chosen by Gallup will ask their own questions -- allows the candidates to engage directly with voters on both domestic and foreign policy issues. Style could be a bigger challenge for Mr. Obama, who appeared listless in the first debate on Oct. 3. The president buckled down this weekend for three days of debate preparation in Williamsburg, Virginia, where he faced fewer distractions and engaged in less campaigning than he did ahead of the first debate. When reporters over the weekend asked him how the preparation was going, he said, "It's going great!" His response was markedly different from two weeks ago when he told a supporter that debate preparation was "a drag." Obama campaign spokesperson Jen Psaki told reporters that voters watching this week's debate "should expect to see a much more energized President Obama making a passionate case for why he is a better choice for the middle class." Psaki said the president will focus on Romney's plans for changing Medicare, his views on women's reproductive rights and Romney's tax cut plan. Obama campaign senior strategist David Axelrod added on Fox News Sunday, "You know, Paul Ryan was on your show a couple of weeks ago and could not answer how Governor Romney would pay for his $5 trillion tax plan and had all the time after your show to prepare for the debate. And in 90 minutes, he still couldn't explain it. So, we're going to give Governor Romney another chance on Tuesday to try and square this impossible circle." Romney, meanwhile, is preparing for the debate by working on stagecraft and body language, according to Politico. "Over this past weekend, Romney advisers and the candidate himself were grappling with a new challenge," Politico reported. "It was how to repeat the success of Denver--when Romney at last managed to find something like his authentic voice--on Tuesday in a debate with a town-hall format that will push Romney much further out of his newfound comfort zone." On Fox News Sunday, Romney campaign senior adviser Ed Gillespie said, "The governor is going to do what he did on the last debate. He's going to talk about his agenda. He's going to talk about his policies and there is a big choice election here between President Obama's policies and Governor Romney's policies." On CBS' "Face the Nation," conservative commentator Bay Buchanan said Romney can keep up his momentum by being authentic. "What the governor has to do and what he will do is be exactly who he was at that last debate, be himself." Republican pollster Frank Luntz, meanwhile, said on "CBS This Morning" that Romney needs to build on his increasing favorability rating and tear down the president's by casting the president as a cynical, negative politician. "He's got to make Barack Obama the negative campaigner," Luntz said. Mr. Obama, meanwhile, faces the challenge of attacking Romney without appearing too negative, Luntz said. The town hall-like format should make the debate "easier and more difficult for both" candidates, Luntz added. "The American people love the town hall format because the questions are asked the way real people would ask them." Both candidates have reportedly expressed a common concern about the format -- specifically with regard to engaging with the debate moderator, CNN's Candy Crowley. The candidates and the Commission on Presidential Debates agreed earlier this month that the moderator would play a limited role, Time reports, and both campaigns have expressed concern over the fact that Crowley has said she intends to intervene with follow up questions and guide the discussion as she sees necessary. "I think it's always best when these guys engage with each other, but that doesn't mean I won't engage with them if that gets us closer to what we need," Crowley told the Huffington Post.